Exascale computing, which has been long talked about, is now – if everything remains on track – only a few years away. Billions of dollars are being spent worldwide to develop systems capable of an exaflops of computation, which is 50 times the performance of the most capacious systems the current Top500 supercomputer rankings and will usher in the next generation of HPC workloads. The challenges are substantial. The AMD researchers noted that an exascale system will consist of some 100,000 interconnected server nodes that will have a power envelope of about 20 megawatts, as well as the memory bandwidth and capacity to address the compute throughput demands and execute massive workloads, with each node delivering more than 10 teraflops while consuming less than 200 watts. 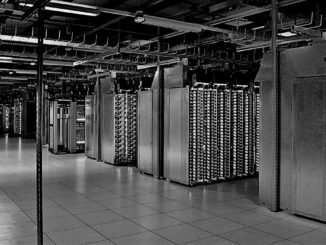 Currently, the most energy-efficient supercomputer in the world today would have to improve its flop-per-watt ratio seven-fold to meet the target set for exascale systems. In their paper – titled Design and Analysis of an APU for Exascale Computing – the researchers say that the ENA could meet those demands. According to the study, at the core of the ENA is what the authors call the Exascale Heterogeneous Processor (EHP), a high-performance APU that includes not only the integrated CPU and GPU resources but also on-board 3D High Bandwidth Memory (HBM) like AMD currently uses on its graphics cards. At the same time, the EHP leverages a network of external memory devices interconnected with point-to-point links similar to the Hybrid Memory Cube (HMC) DRAM architecture. The chip uses a modular “chiplet” design that takes advantage of on-die stacking technologies. The EHP offers two CPU clusters in the center of the package, with each cluster holding four multi-core CPU chiplets that are stacked atop an active interposer base die. On each side of the CPU clusters are four GPU clusters, with each cluster comprising two GPU chiplets stacked on an active interposer. Atop each GPU chiplet is a 3D DRAM stack, which the researchers said could be a future generation of JEDEC HBM. In addition to all that, to hit the small power budget of 200 watts, the EHP uses such power optimization technologies as near-threshold computing, asynchronous circuits, low-power interconnects, and data compression circuitry, and power management techniques as active DVFS and power gating controls. The researchers used simulations to test how several scientific and security applications – including MaxFlops (for compute intensive workloads), LULESH, SNAP and XSBench (memory-intensive), and CoMD (balanced) – would run on ENA modules. More detail about the architecture can be found in the study, and the authors were encouraged by what they found. For example, they tested the multi-chiplet design against a monolithic exascale-level processor. In the chiplet design, messages between remote chiplets require additional steps – the message runs from one chiplet to the interposer layer by way of through-silicon vias (TSVs), across the interposer layer, and then to the destination chiplet through TSVs. This all adds potential latency to the communication. However, “the performance impact of the large out-of-chiplet traffic is relatively small. The largest performance degradation compared to the monolithic EHP is 13 percent, while some application kernels, such as SNAP, have a negligible impact,” they wrote. AMD’s research into its APU-based ENA compute and memory engine illustrates the dynamic nature of the development efforts worldwide across the globe. Most supercomputers today are built on Intel’s architecture, but as the exascale era gets closer, researchers, scientists, and supercomputer makers are investigating a broad array of options. Fujitsu officials last year confirmed that they were moving from Sparc64 chips to the low-power ARM architecture for the next generation of supercomputers, including an exascale-capable computer set for 2020. China, with its upcoming Tianhe-3, will use homegrown processors. We can now add AMD APUs to the list of possible exascale compute units.